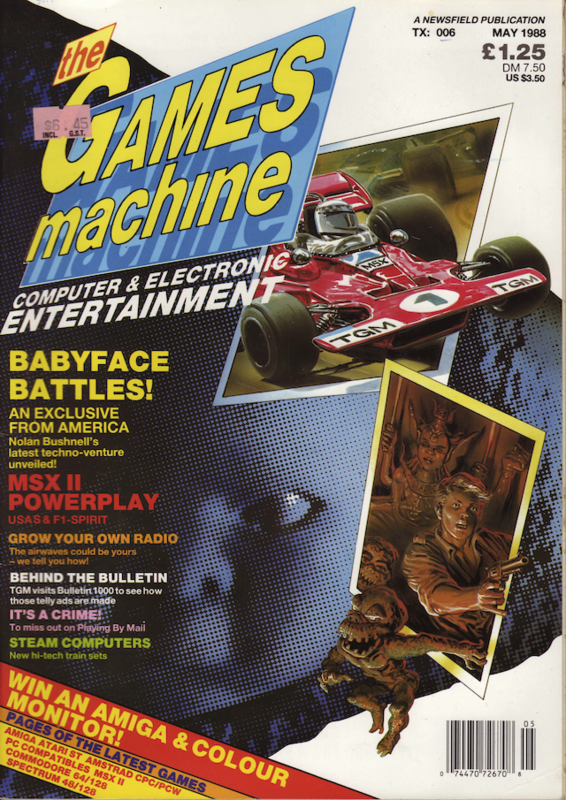 The first ever British entertainment software conference took place, with representatives from Britain's top software houses and distributors in attendance. A gala awards dinner was held which handed out awards based on Crash and Zzap!64 reader awards. Best Spectrum game went to "Driller" from Incentive, with "California Games" from Epyx/US Gold winning best C64 game. Ocean won best software house for readers of both magazines. Games Workshop opened a new retail outlet on Oxford Street and a queue of "well over" 1000 people showed up. Microprose announced they were ramping up recruitment throughout Europe. The UK studio would last until 1996ish - the company I was at picked up one of the titles that had been in progress. It was a very promising game, but sadly never saw the light of day. Microdeal was about to release the first laser disc interactive game for home computers. Titled "Journey into the Lair" it was for the Atari ST and featured the "Dragon's Lair" PAL video disc, along with the new Dirk Daring game. To play it you would need to buy the disc (£99.95), a cable to connect a laser disc player to the ST (£19.95), and of course a laser disc player. Mel Croucher went about interviewing various people at the entertainment software conference concerning their first jobs. The only developer (as opposed to biz or marketing person) he talked to was Jeff Minter who, it turned out, had cleaned the bogs at a fork lift truck factory in 1978. The second and final report on what was on show at the International Toy & Hobby Fair. The biggest story was the success of Hornby who had faced financial ruin 6 years earlier, but thanks to a diversified product line up along with new and interesting additions to its traditional train and Scaletrix sets had managed to turn things around. Elsewhere, radio controlled cars were the rage, and there were new pocket pinball machines and some "insipid" electronic cuddly toys. A look at "Bulletin 1000", a video series promoting new game releases that was sent to retailers to play instore. It started with a presenter, competitions and previews/ads, but after the second episode it changed to a much shorter format and just featured the previews/ads. Mel Croucher ranted about the UK's crack down on pirate radio stations and issued a kind of call to arms for people to setup their own stations. Activision had a busy schedule with ports of "Karnov", "Afterburner", "R-Type" and "Time Scanner" on the horizon. Not only that, but they were to publish "Faerie Tale" and "Fire Power" from Microillusions and "Archipelago" from Astral Software. Incentive were to release "Dark Side", a sequel to their very well received "Driller", and an update to their "Graphic Adventure Creator", though this time it was an ST exclusive and called.. "ST Adventure Creator". "Starglider II" was on it's way from Argonaut, and Rainbird teased a long rumoured new game by Pete Cooke: "Earthlight"
"Sidewinder" Mastertronic - Amiga 93% "In short, Sidewinder is a fun shoot-'em-up which, at the price, is a must." "F-1 Spirit: The Way to Formula One" Konami - MSXII (score missing) "Essentially F-1 Spirit offers a tough, top rank race game with lots of playability and endurance"
"Impossible Mission II" Epyx/US Gold - C64/128 86% "For fans of the original who are not expecting too much of a change the sequel is probably ideal, for others Impossible Mission II offers the best platform game around, although the lack of a save function could become irritating." "Jet" subLOGIC - Amiga 89% "In conclusion Jet is a very attractive, if expensive, arcade/simulation flight game, well worth a look." "Ikari Warriors" Elite - C64/128 87% "Has it been worth the wait [the game took over 2 years to develop]? It most certainly has!" Spectrum 84% "Ikari Warriors is enjoyable mindless blasting fun, worth of any fan of the original." "Usas" Konami - MSXII 88% "Attention to detail is omnipresent and a fantastic, impelling urge to get to the final battle is instilled by the steady progress one makes with practice - and the enjoyment to be gleaned from making it." "Strike Fleet" Lucasfillm/EA - C64/128 85% "...is absorbing, thought-provoking, demanding and a highly realistic computer representation of modern naval warfare." "Pac-Land" Gannon Designs/Namco - C64/128 85% "Presentation rides high with end of level and bonus stage sequences taken from the original coin-op, all combining to make Pac-Land one of the most accurate conversions seen for a long time." "Sherlock - The Riddle of the Crown Jewels" Infocom - C64/128 86% "Sherlock is enjoyable, its initial ease encourages you to play on, and as puzzles are solved and time ticks by, a certain necessity to crack the case is instilled."